We’re thrilled to be an Accoya® approved supplier. Accoya offer high performance, long-life modified timber. The wood is the result of decades of research and development that has brought together a long-established, extensively proven wood modification technique – acetylation – and leading-edge patented technology to create a high performance wood, ideal for outdoor use and challenging applications. 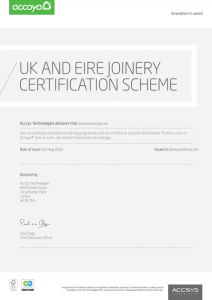 This accreditation allows us to offer our customers the high quality workmanship products they have come to know and expect from joineryworkshop.com, but now with the assurance and back-up of a 50 year guaranteed wood, specifically developed to excel outdoors. Accoya is 100% non-toxic and produced from FSC® timber. If you would like a quote or to know more about the Accoya wood product we can supply for your home renovation project, please call our specialist joiners on 0333 6000 196, email enquiry@joineryworkshop.com or Book A Survey. Read more about Accoya here: www.accoya.com. Customer Case Study: Making Victorian windows look great again! yoursashwindows.com Ltd is an Appointed Representative and provides a pure client Introduction through Improveasy Ltd., a company registered in England and Wales (Co. Reg. number 7807352). Registered Office: Manchester Business Park, 3000 Aviator Way, Manchester M22 5TG. The firm is authorised and regulated by the Financial Conduct Authority (FRN 708623). The firm is authorised as a Lender (limited only to green deal finance plans). It also acts as a Broker, not a Lender, and offers credit facilities from a panel/one lender. The credit is subject to application and status.